Step aside.. Cat cafes, dog cafes, rabbit cafes, owl cafes. 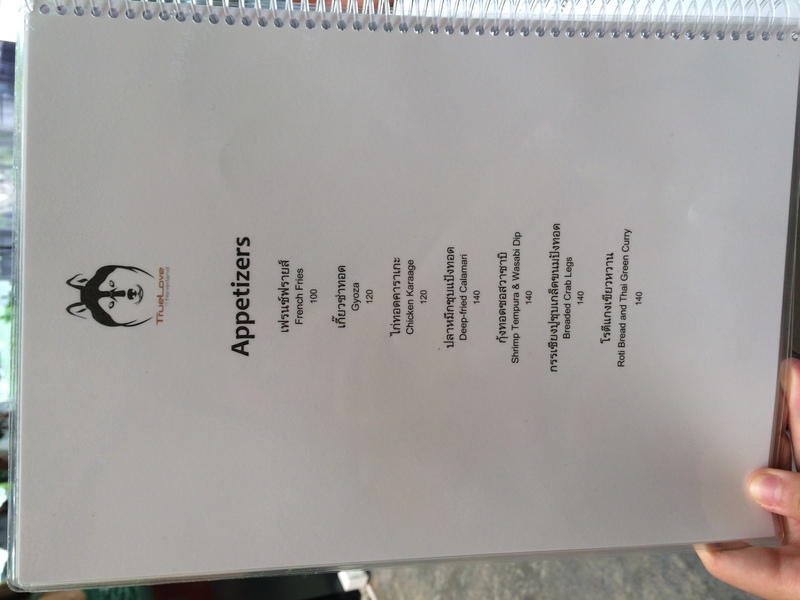 BECAUSE nothing can beat TrueLove Cafe in Bangkok. 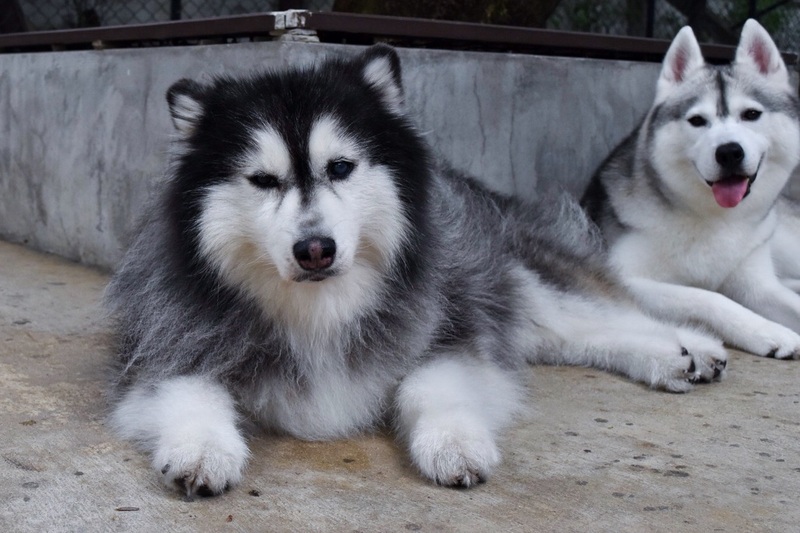 HUSKIES. 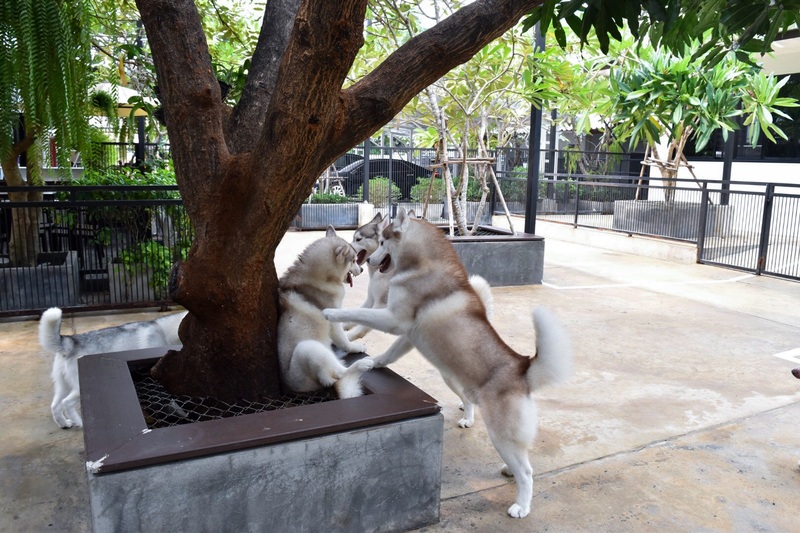 YOU CAN PLAY WITH HUSKIES IN THE CAFE LEH. It’s so aptly named because the experience you’ll get here is akin to TRUE LOVE. 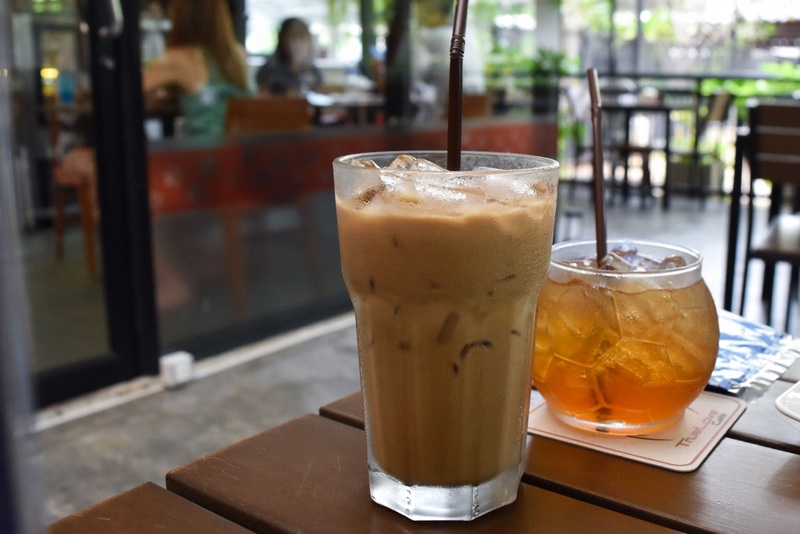 In this post, you’ll get the full fledged experience in this cafe, including details on how to get there, admission fees, and basically everything you need to know. 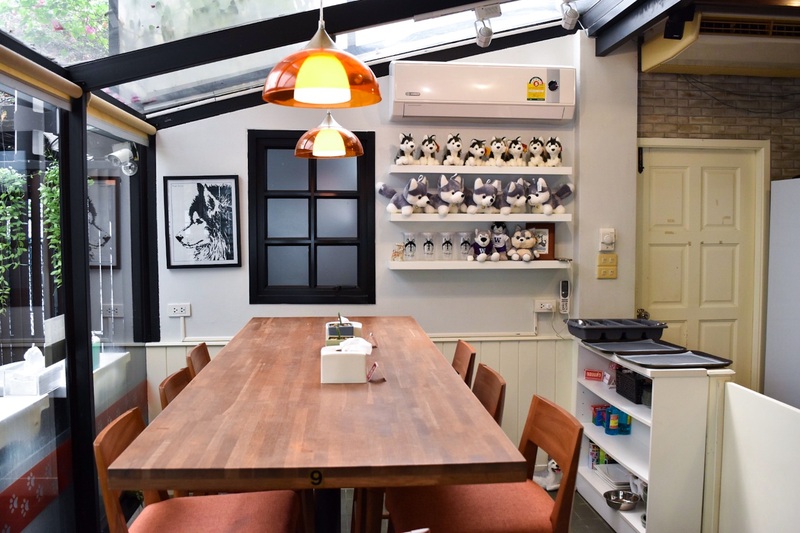 I’ll do my best to share so that you’ll be able to experience the cafe without even being there, and provide more detailed information for those who are intending to make a trip there! 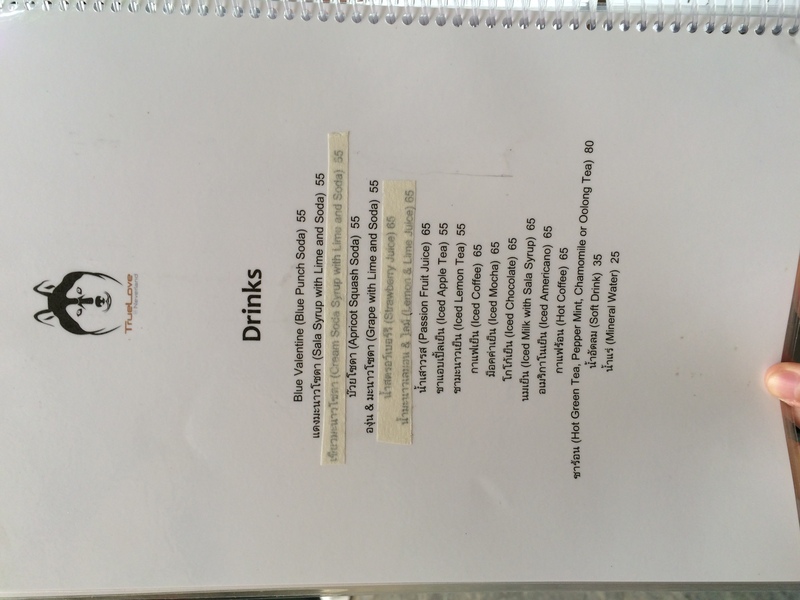 TrueLove is also featured in my post of unique cafes you HAVE to visit when you’re in BKK (trust me, I’m confident these are unique enough. Heheh). 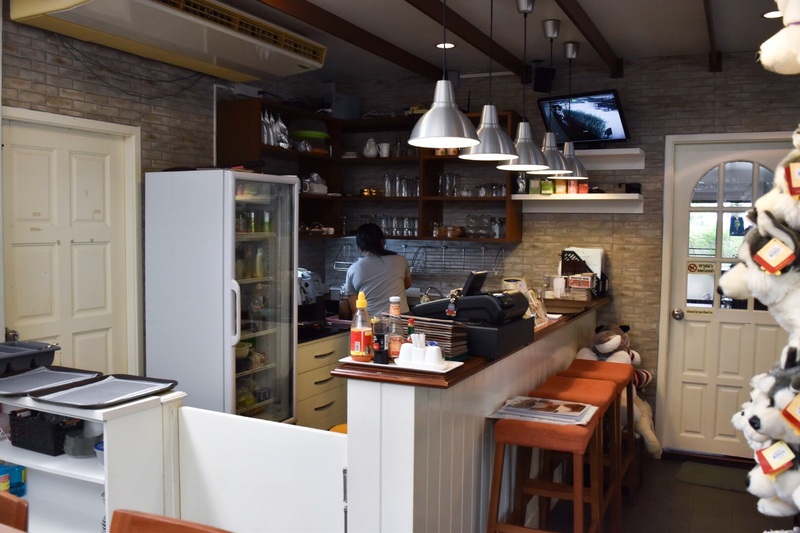 The first thing you need to know is that it will require some time for you to travel to get to TrueLove cafe! 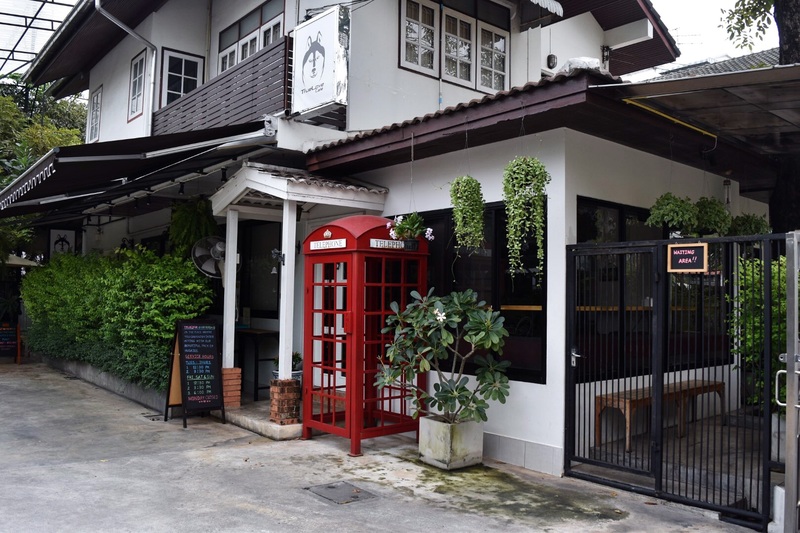 The nearest BTS station would be Ari, and from there you can take a good 25 to 30 minutes walk to TrueLove using Google Maps to aid you in the navigation or take a cab/tuktuk to get there. Don’t worry if you happen to think you’re on the wrong track when you walk through the private estates, that IS supposed to happen. For those who are intending to take a cab, here’s the address in Thai for you to copy and pate for your cab drivers: 153 ซอยอารีย์สัมพันธ์ 2 ( คนละซอยกับอารีย์ 2 นะคะ) สามเสนใน พญาไท กทม, or you could go woof woof to tell them you’re going to the husky cafe. Hehe. You are now here at the entrance of TRUELOVE! When you arrive, you should be able to hear some of the dogs barking upon your arrival! Let’s go closer to the gate… HARROS. Do take note of the following visiting hours so as to maximize your time with the huskies! Each round takes 1 hour. 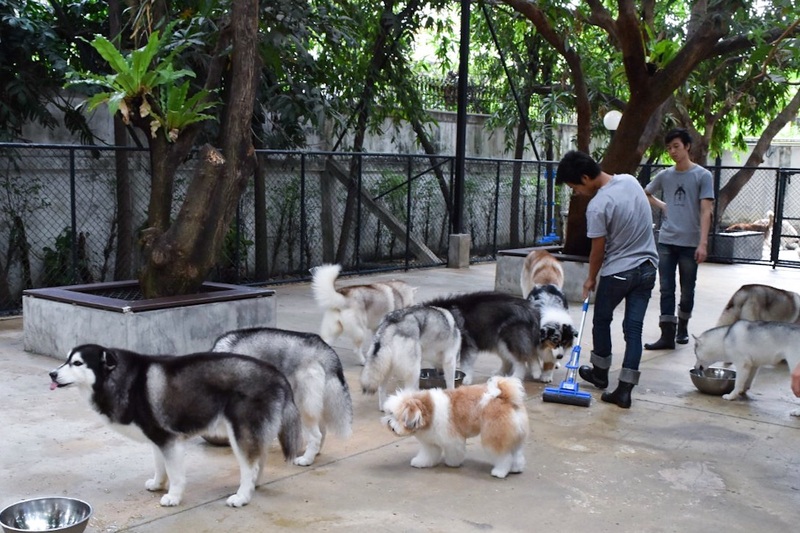 So that means, if you arrive at 12.30pm, you get to play with the huskies till 1.30pm, and there won’t be any husky activity till 3.30pm. 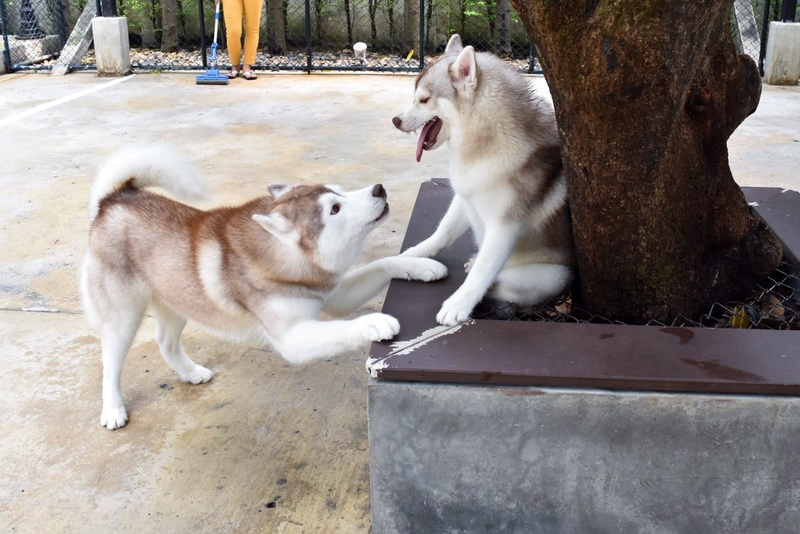 So if you arrive at 2pm, you got to wait till 3.30pm for the next husky interaction! Understand? Also, some of the blog posts are a little outdated, so we got caught by surprise when we arrived with regards to the entry fees. 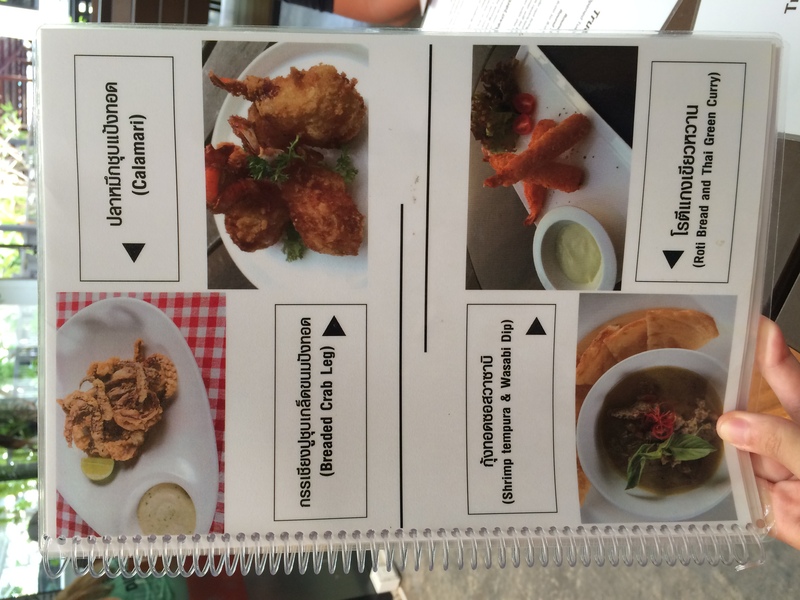 The latest (2016 latest) update is that each entry would cost 350 BAHT (S$13.45), and this entry ticket entitles you to one drink and one cake of choice! 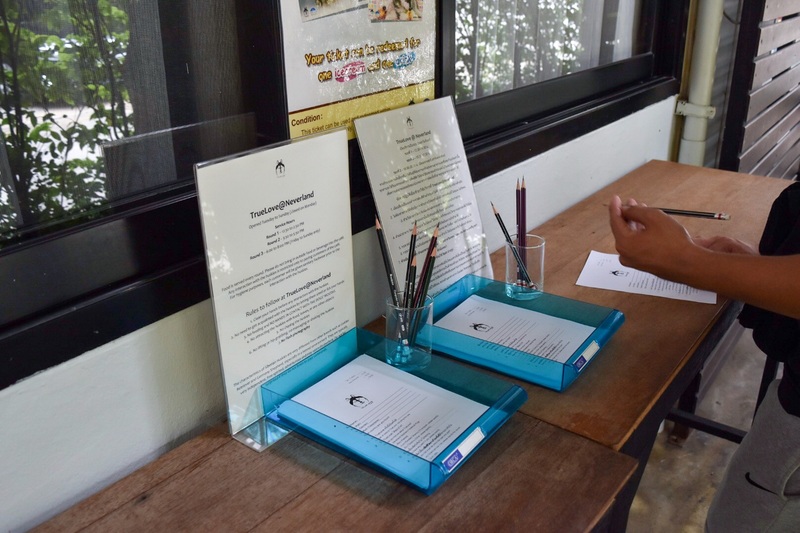 After paying at the counter just at the entrance, you’re required to fill in the following forms! A closer look at the notice. 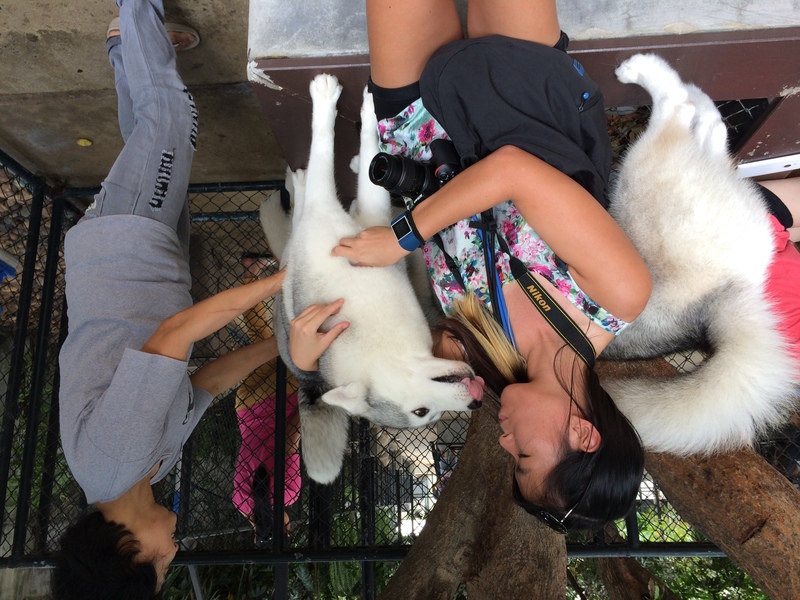 Even though they say till 2.30pm, we were only allowed to play with the huskies for 1 hour! So your best bet? Just arrive before 12.30 so you can enjoy your food and drinks then play with them, OR arrive at 12.30 to play with them then eat your food. HAHA! Here’s how the cafe looks like on the inside. 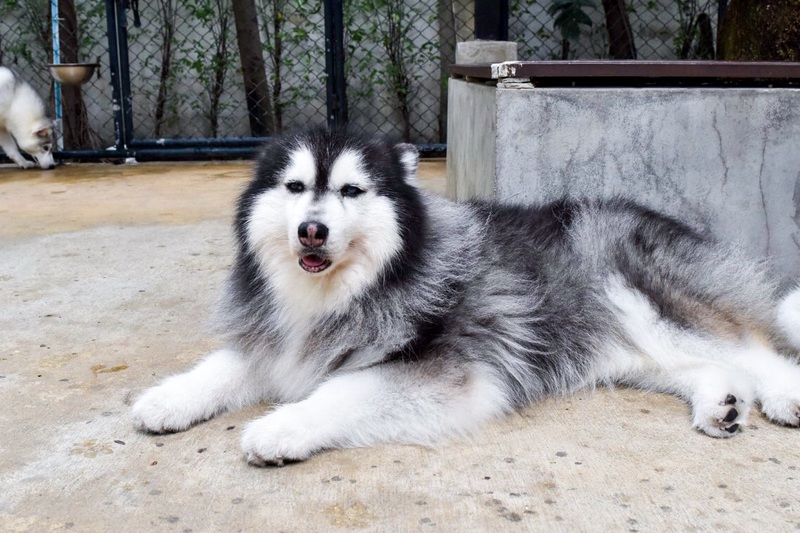 HEHE the place very nice, there’s al fresco dining as well where you can take a closer look at some of the huskies roaming about before and after visiting hours. The counter to pay for your souvenirs or more food. I bought my toy here! Hehe! With the entry fees, you can choose any drink from here, and any cakes (milicrepes or ice cream cakes) from their display! 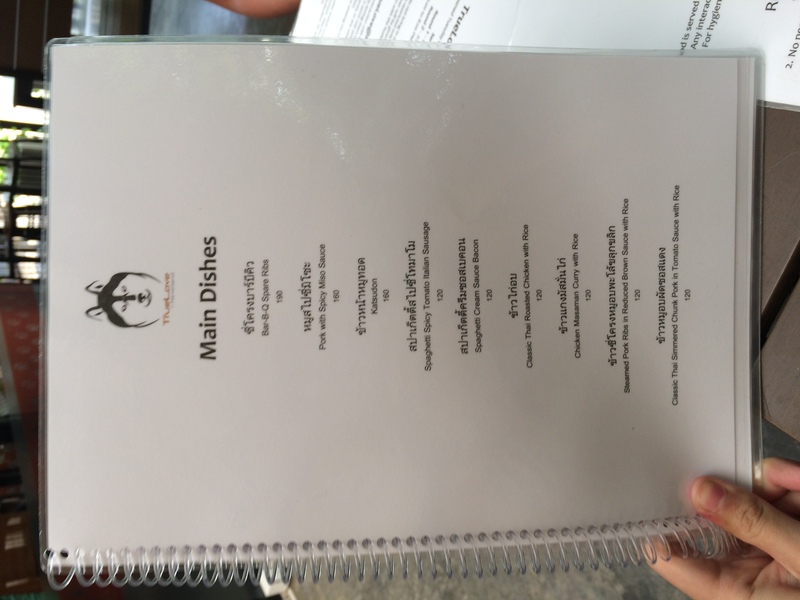 Those who want a more substantial meal can opt for their main dishes! 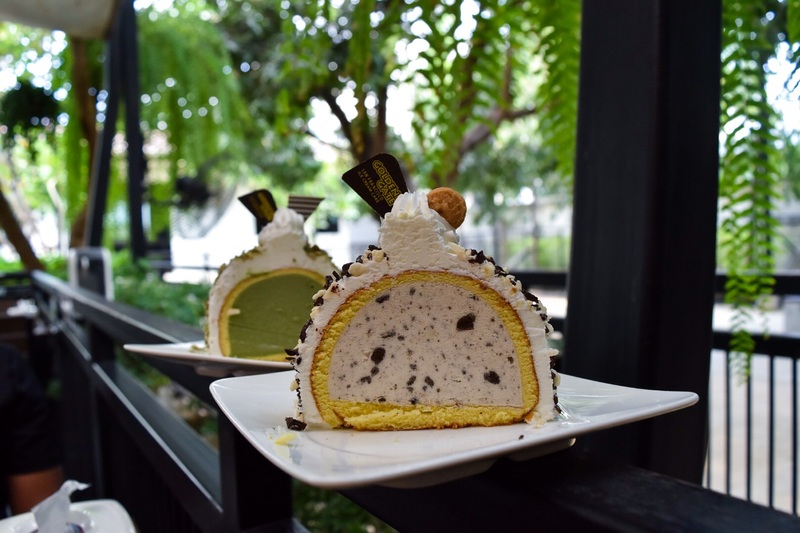 Or peckish..
For 350 baht (~S$13.45) per pax, you get the entry into the husky pen, a drink and this ice cream cake! Pretty worth it IMO! This is the cookies and cream ice cream cake and in the background, matcha! PRETTY YUMMY! Their iced coffee was surprisingly good as well! Our view from where we sat! There are fans outside so that it doesn’t get overbearingly hot. BUT there are mosquitoes out there.. 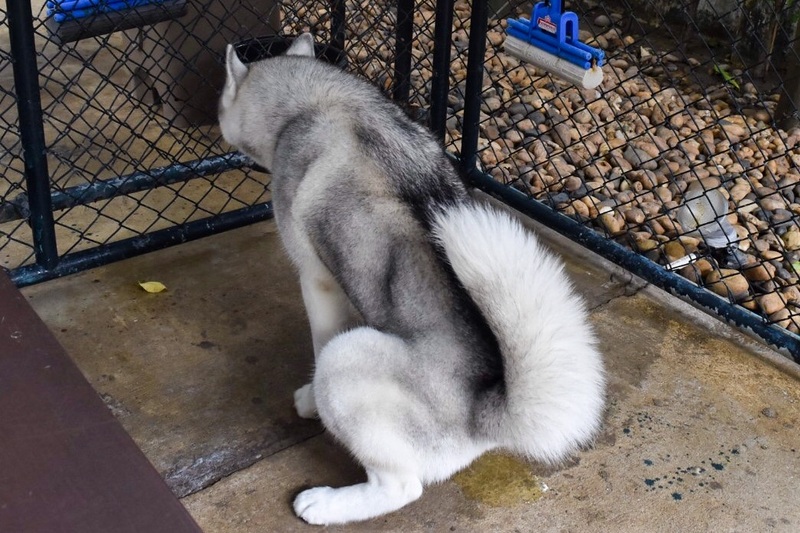 When it is time for you to enter the play pen for the huskies, you’d be provided with the covered plastic footwear, and you’re required to take off your shoes, wash your hands and sanitize them before entering! 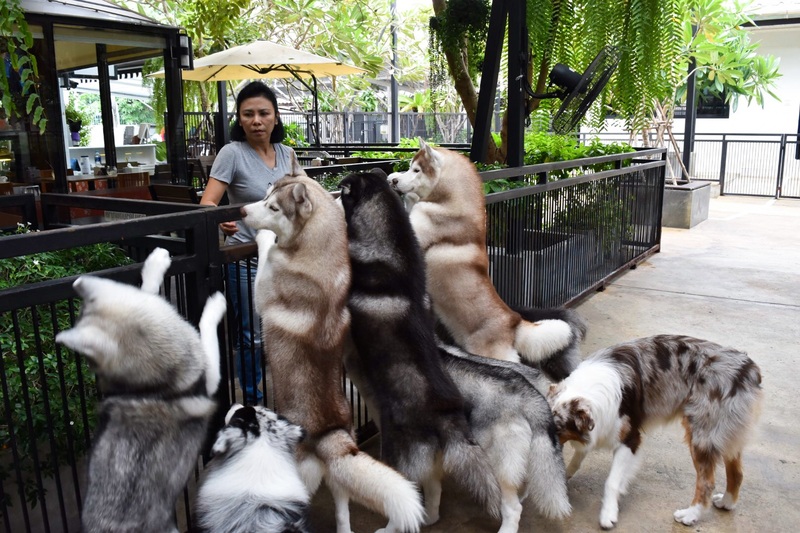 According to the TrueLove owners, there are 25 Huskies, 2 Australian Shepherds, 1 Japanese Akita and 1 little MoMo in the pen! 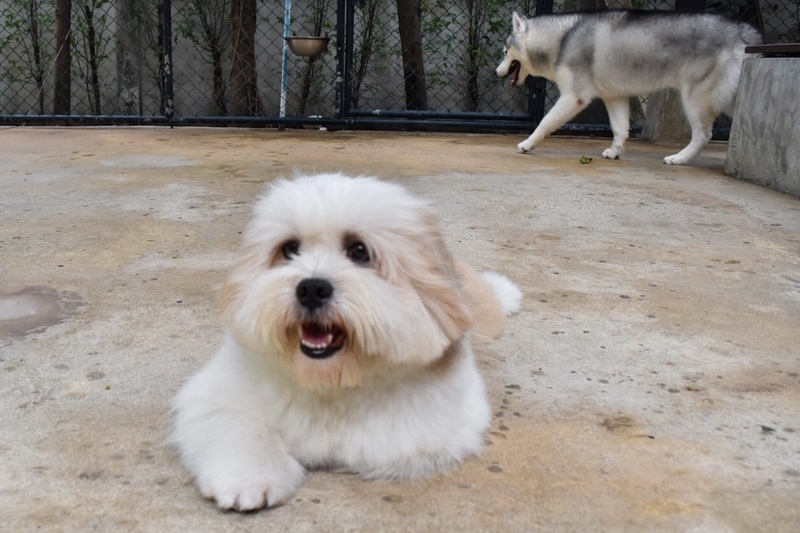 Not sure which is which cause I’m not an expert on dog breeds, I only know my shih tzu and I know who’s MoMo. Pardon that face, but this is confirm MoMo, because he’s the only odd one out! SUPER CUTE! 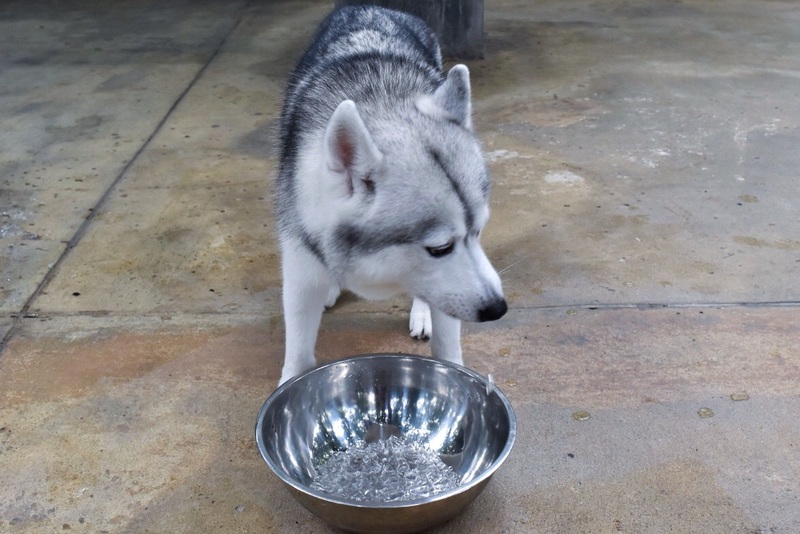 You’ll also see ice filled food bowls, these are for the huskies to cool themselves down in the sweltering heat. 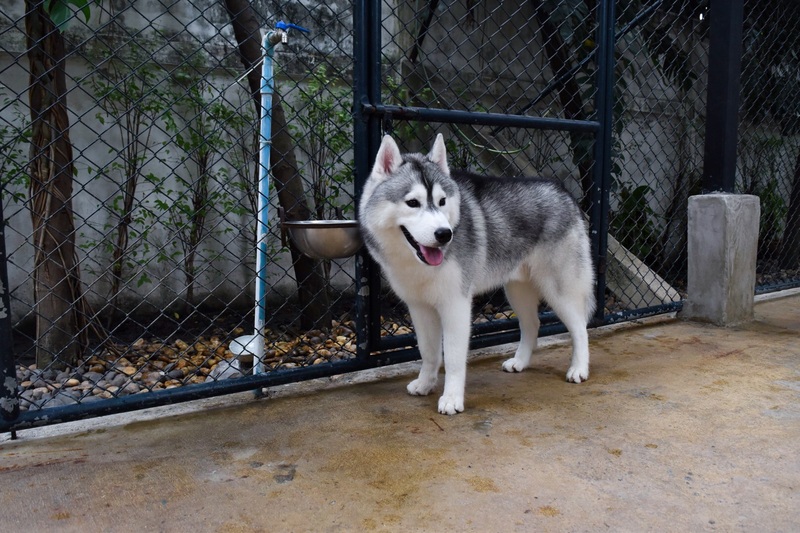 At the start of each session, you’ll see the staff feeding the huskies, so it’s a really very adorable sight with all of them standing on their hindlegs. VERY CUTE. 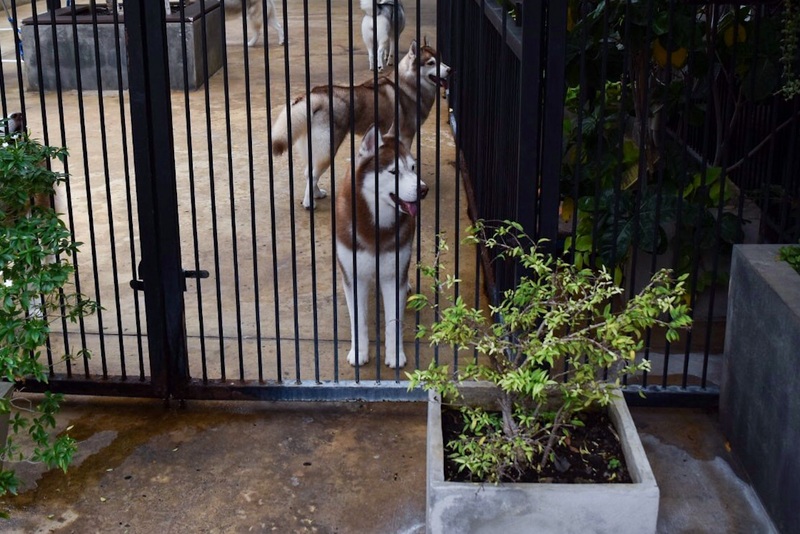 Besides the big space, there are 3 other “enclosures” where some of the huskies are being kept. Some because they are still people shy, some cannot mix with others, or some need the fan or like to pee! 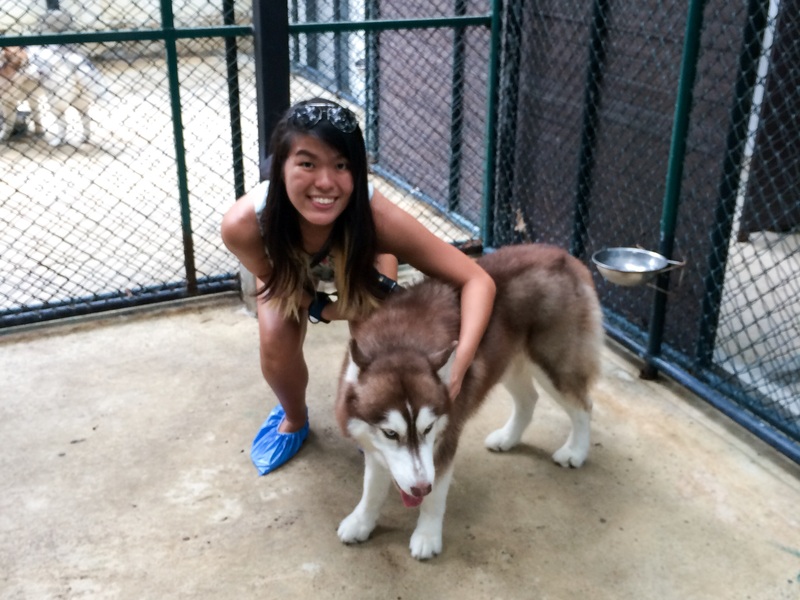 This was taken in one of the “enclosures” with just 2 of the huskies! This was in the other “enclosure”! Yeah, they all pee here, but it gets cleaned up almost immediately! Haha! Is it love at first sight? Yes it is. 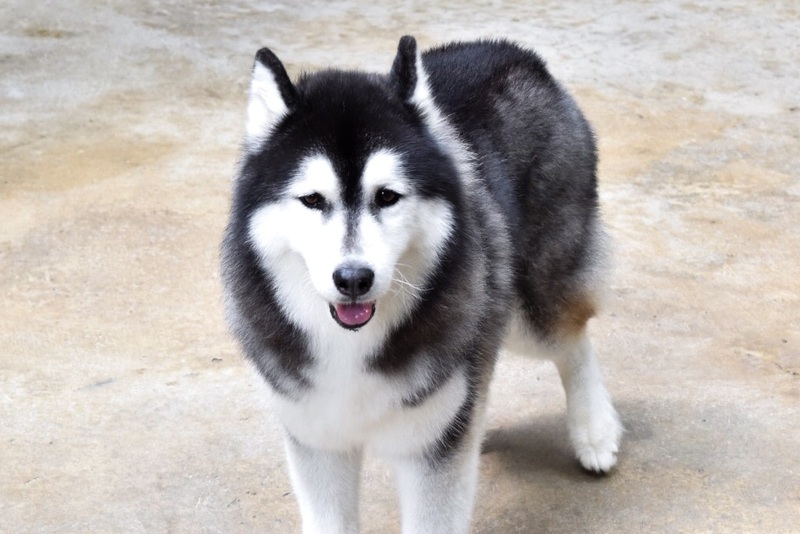 The following are pictures of all the other huskies in the big space! 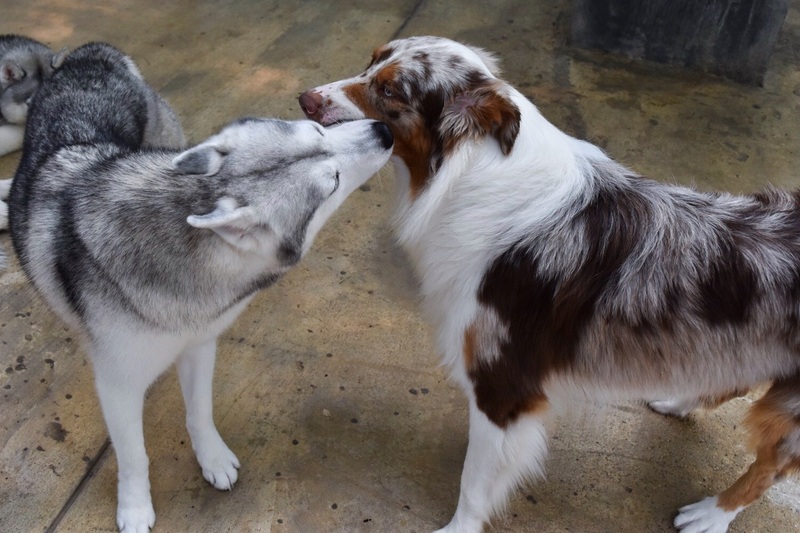 Umm they got scolded for this public display of affection..While the other husky looks on..
One sided love because the recipient is obviously not interested. This looks like me looking at my crush. Is it me or does he look damn playful? Hahaha! After a while, most of them get a little bored/tired (See above), and so will you lah really. You guys can stone together on the floor or reach over to disturb them. 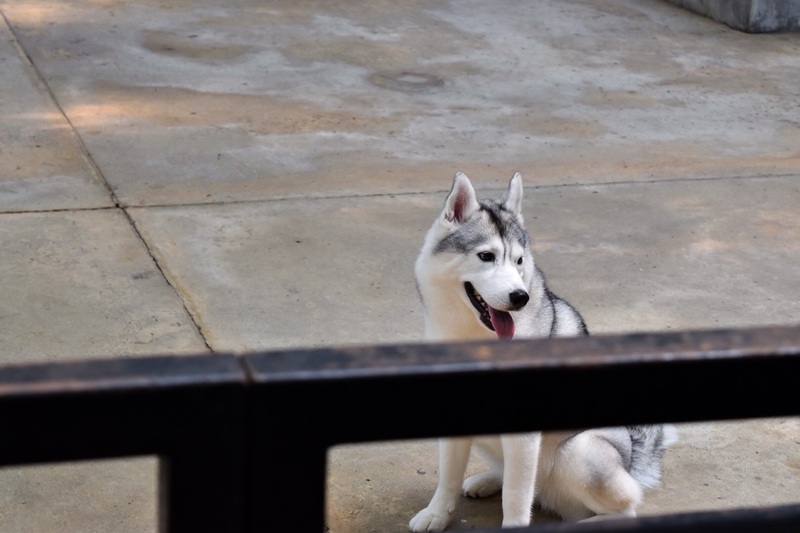 1 hour is really more than enough to play with them, especially since most of them are not the clingy kind, they really can’t be bothered with you. Haha! At 1.30pm, you’ll realize that all of them will start getting quite fidgetive. And those kept in the separate enclosures would start going a bit crazy, because they know it’s time to head back into their beds! That’s what I call conditioning. HEHE! Hehe up till today, I still can’t stop watching this video! Super adorable and look at that little dog trailing behind! SUPER CUTE! 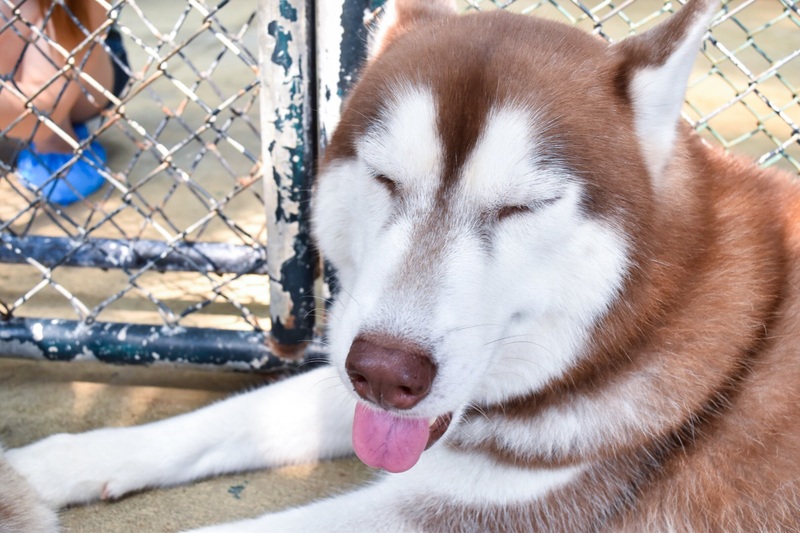 Also, do not fret if it rains though because they have roofs to ensure that the grounds remain dry for you to interact with the huskies! 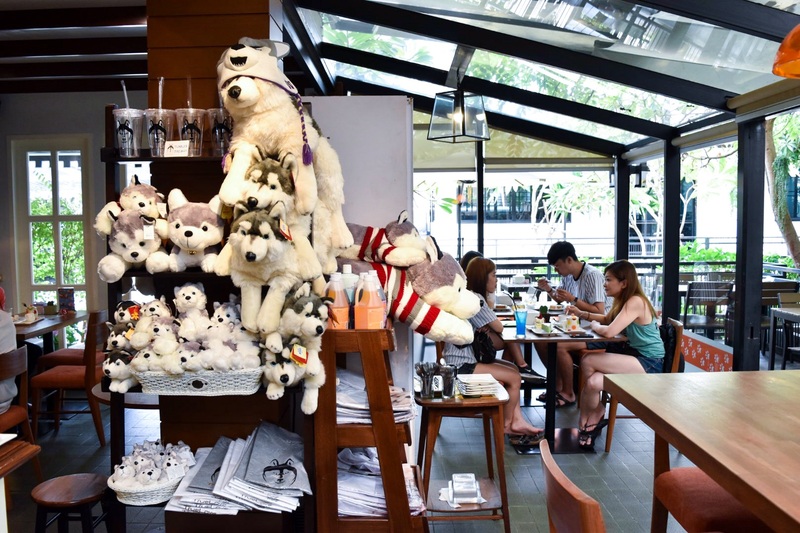 After the huskies go have their break, you can finally sit down and relax at the cafe, and enjoy the food! On the way out, get a souvenir or 2 to remind yourself of this super awesome experience! 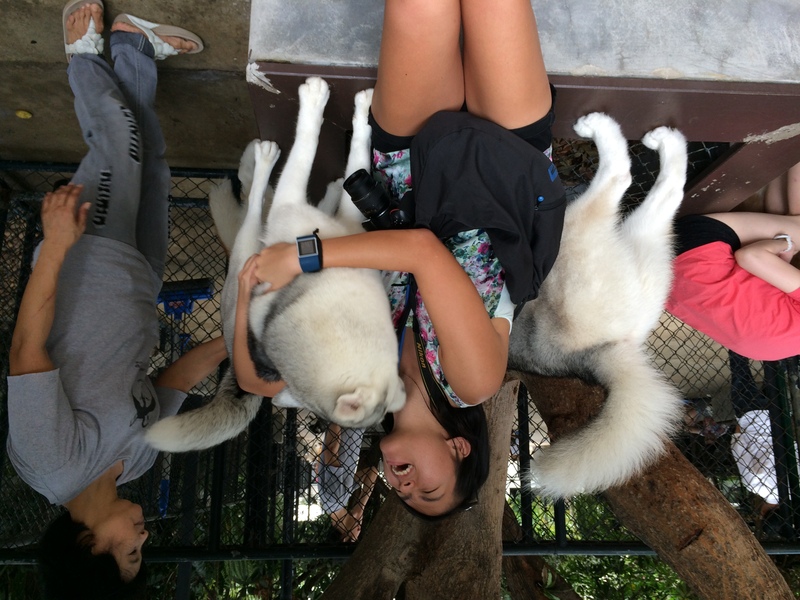 It’s not everyday you get surrounded by 25 huskies eh? The best part? TrueLove has this service of helping you to call a tuktuk OUT to the main road or BTS for a FLAT rate of just 40 baht! So basically you don’t have to fret about the journey out from the ulu area, just need to figure your way in! GET A CAB LAH, easiest! What do I think of this place? To me, this was one of the highlights of the trip, really. I don’t think I’ll ever forget this experience because it was SO MUCH FUN AND EXCITEMENT! 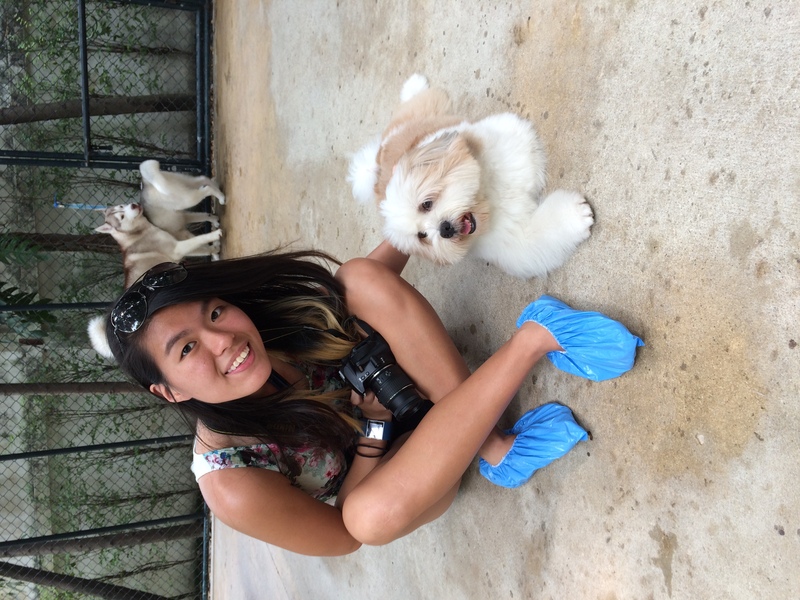 For dog lovers, YOU MUST COME HERE. You’ll love it. 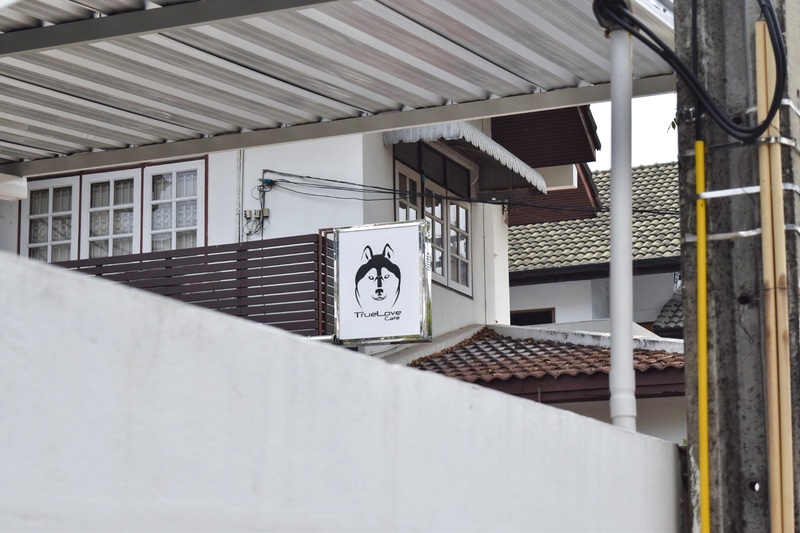 It’s definitely worth the time and effort to head down to TrueLove cafe if you’re still contemplating because I doubt you’ll ever find a experience like this anywhere else! 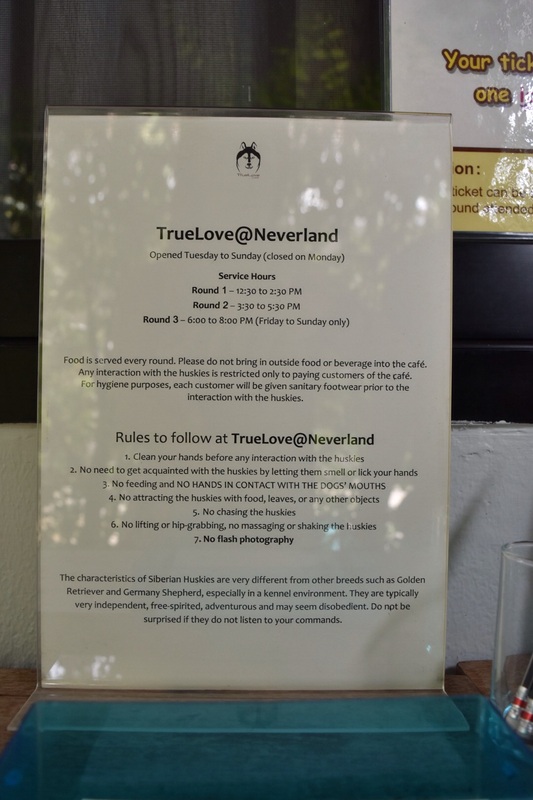 I hope this post helped and allowed you to experience the super amazing time we had at TrueLove! If you wondered where we went or what our itinerary was on this very day, you can check it out here! 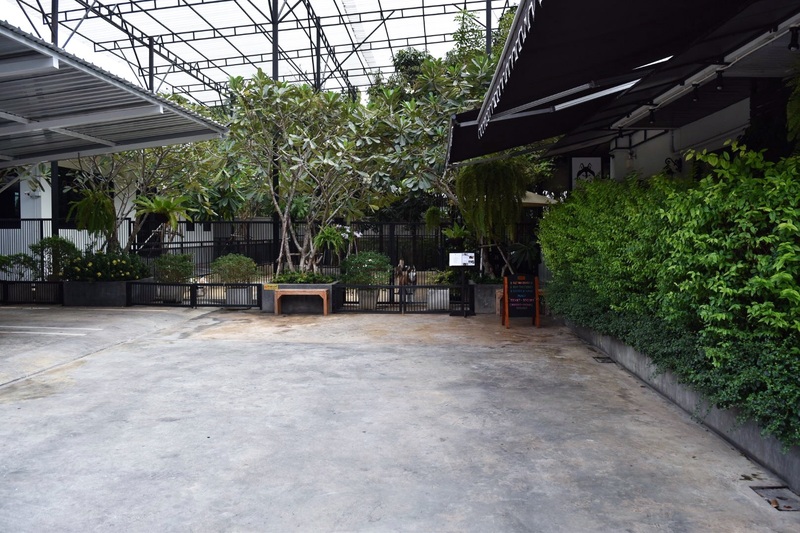 Besides, there’s a mall at Ari BTS so you could always head there to shop, and it’s only one stop away from MoChit, and that means you can come here before or after visiting Chatuchak over the weekends. PERFECT. 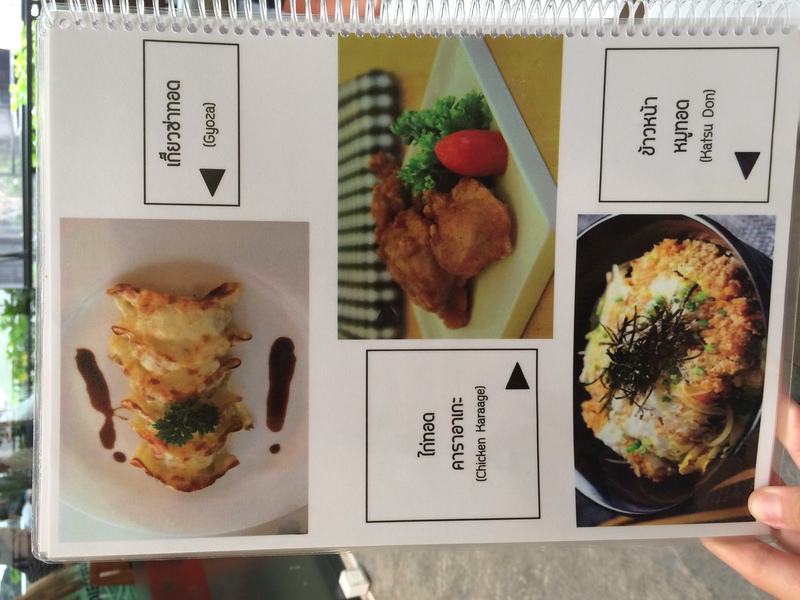 Chir Chir Launches HONEY BUTTER CHICKEN. Omo.